According to a new study conducted by researchers from King’s College London in the UK, the number of moles on an individual’s right arm could be used to predict the risk of melanoma. Study researchers suggest that the more moles a person has, the more likely they are to develop melanoma, which is considered the deadliest form of skin cancer. Each additional mole, according to researchers, represents a two- to four-percent increased risk for melanoma. Since counting every mole on a patient can be time-consuming in a primary care setting, researchers wanted to determine whether the number of moles on a specific area of the body could be used to estimate the total number of moles on the entire body. This would, in turn, indicate a person’s risk for melanoma. Between January 1995 and December 2003, the research team analyzed data of nearly 3,600 female Caucasian twins who were part of the Twins UK study. Nurses administered a freckle and mole count on 17 body areas of each participant; they also assessed skin type, hair, and eye color. Findings were replicated in a smaller study that involved 400 male and female participants. Researchers found that the number of moles on a person’s right arm was the strongest predictor of mole count for the entire body. Women who had more than seven moles on their right arm were nine times more likely to have at least 50 moles on their entire body. Women who had at least 11 moles on their right arm were likely to have more than 100 moles on their body, indicating they were five times more likely to develop melanoma. The team further discovered that the number of moles found slightly above the right elbow was a significant predictor of whole-body mole count, as was the mole count found on the legs and on men’s backs. Dr. Claire Knight, of Cancer Research UK, notes that less than half of melanomas develop from existing moles. 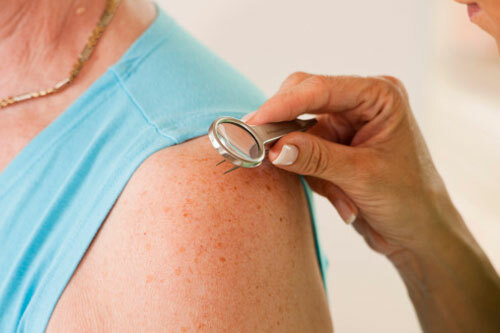 She stresses the importance of patients telling their doctors about any change in size, shape, color, or feel of a mole or a normal patch of skin. Study findings were published in the British Journal of Dermatology. Whiteman, H., “Number of moles on right arm could predict risk of deadly skin cancer,” Medical News Today web site, October 20, 2015; http://www.medicalnewstoday.com/articles/301198.php. “More than 11 moles on your arm could indicate higher risk of melanoma,” King’s College London web site, October 19, 2015; http://www.kcl.ac.uk/newsevents/news/newsrecords/2015/October/More-than-11-moles-on-your-arm-could-indicate-higher-risk-of-melanoma.aspx.